How much would it cost you to hire your own bartender for the evening? That is essentially what the Margaritaville Mixed Drink Machine does for you. 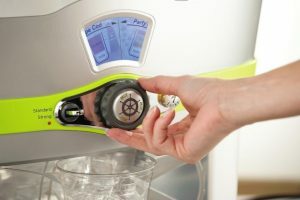 It does all the mixing and dispensing of mixed drinks – and adds a unique twist of fun to the whole affair. If you are having guests over, there is no need to keep running around serving everyone. Just load up the right ingredients, power it up and everyone can serve themselves – choosing from up to 48 cocktail options. The whole process is fast, it is easy and it is a lot of fun. This gizmo may look big and complicated, but setup is actually a breeze. Out of the box, the unit comes fully assembled with everything where it should be. You will notice that there are four tankers. These are for filling with ingredients. One tanker is for alcohol, which can be rum, tequila or vodka. The other three tankers should be filled with a sour mix, cranberry juice and orange juice (pulp-free). The type of alcohol you put in the booze tanker will determine what drinks can be made by the machine. Each type of alcohol therefore produces up to 16 cocktail options. Once everything is setup, the machine will confirm that the tankers are inserted and will ask you which alcohol you are using. Once you confirm the type of alcohol in the tanker, the machine literally gives you a cheer and you are good to go. A dial wheel lets guests make their choice of drinks from the 16 options available. To make things more interesting, you can press the ‘I feel lucky’ button and the dial randomly chooses a drink for you. This, combined with the machine’s sound effects, will definitely crank up your party. There is also a button for requesting an extra strong shot. There is also another nice twist to the machine; if you go too long without using it, it automatically spins the wheels and plays sound effects to draw you back. This can be a bit annoying after time, but fortunately, you can turn it off. A word of advice; the machine does not chill or freeze liquids on its own. A good idea is to put the filled tankers in the fridge for several hours before the event. During serving, also make sure ice is available. This will keep the drinks chilled for much longer. For ease of use and to ensure you get the best cocktails, the mixed drink machine comes with a handy recipe book. You can use this guide to prepare a wide range of cocktails with different flavors. You will become a cocktail connoisseur in no time. Well, your Drink Machine will, at least. While the machine may seem to be all gimmicks and whistles, the cocktails it makes are actually really good. Of course, they are not high-end custom quality, but for most home needs, they are great. And of course, you’ll save a ton of time by not having to bartend for everyone. 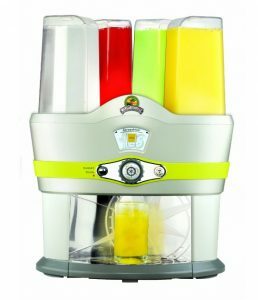 Whether you are having a small party or a family event, the Margaritaville Mixed Drink Machine is a great way to impress your guests while serving them with tasty cocktails. Disassembling the machine is easy. The four tankers and other parts are removable for easy dishwasher cleaning. This is the most popular automated drink machine on Amazon. It’s also the best-rated. Most verified customers are very satisfied with their purchase. They point out how fun it is to use the drinks mixer and how great it is for parties. But apart from the bells and whistles, most agree that the drinks made by the machine are really good. There are a few downsides mentioned by a few customers. For one, the machine does not chill drinks. You have to do the chilling yourself. Second, you cannot substitute the ingredients for any others not mentioned in the recipe book. This may limit you a bit in terms of the choice of drinks. This drink maker is as unique as they come. You get your own bartender to free your time up. And, like any great bartender, this one is not only skilled at the art of making great cocktails, but also entertains your guests. And the drinks really are great!